Animal Instincts Skin Flings Pheasant Dog Toy features a stuffing free interior, giving this toy the advantage over many other plush toys by not only being less messy, but mimicking that of a hunted animal. 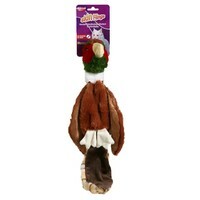 Animal Instincts Skin Fling Pheasant is a fantastic toy that creates maximum fun and minimal mess. Not only is this toy a boredom breaker that helps stimulate your dog's natural hunting instincts, it also acts as a comforter, due to the super soft material which is luxurious to the touch. A squeaker can be found tightly stitched within this plush toy which adds to the limitless fun that this toy creates.